Rugby is a market town in the county of Warwickshire in central England on the River Avon. Rugby is 15 miles east of Coventry, on the east edge of Warwickshire, near the borders with Northamptonshire and Leicestershire. Rugby - Travel by coach - If you'd like to speak to someone about your journey you can ring Traveline on 0871 200 22 33. Rugby - Travel by train - Rugby Station, Station Approach, Rugby, Warwickshire, CV21 3LA. CCTV. Ticket office. Waiting room. Refreshment facilities. Pay phone. Shops. Toilets. Wheelchair accessible toilets. Whole station step free access. Wheelchairs available. Taxi rank. Rugby - Travel by road - Rugby is about 6 miles NW of Junction 17 of the M1 Motorway. The M1 is a north - south motorway which links London to Leeds. Rugby is about 85 miles from London and 120 miles from Leeds. Rugby - Travel by road - Rugby is about 3 miles south of Junction 1 of the M6 Motorway. The M6 Motorway travels north - south and connects to the M1 at Rugby then on to Carlisle. The M6 Toll is north of Walsall and Sutton Coldfield and bypasses the M6 the areas around Birmingham and Wolverhampton. Rugby is about 225 miles from Carlisle. Coventry Airport Customer Services, Phoenix House, Coventry Airport South, Siskin Parkway West, Coventry CV3 4PB. The passenger terminal is located just off the A45 at Toll Bar End Roundabout. Coventry Railway Station is 3 miles from Coventry Airport. 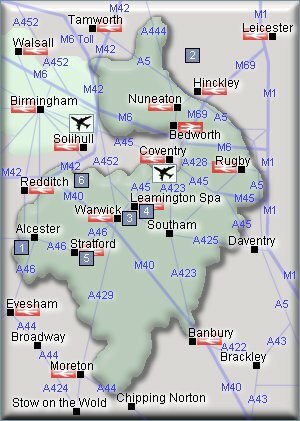 Coventry airport is about 12 miles from Rugby. Rugby - Sport - Rugby Golf Club, Clifton Road, Rugby, Warwickshire, CV21 3RD. Tel: 01788575134. Rugby - Sport - Rugby is home to the game of Rugby Football, where the sport began in 1823. Set in the heart of Warwickshire, Draycote Water near to Rugby offers water sports, fishing, wetlands, nature trails and bird hides. Draycote Water Sailing Club, Kites Hardwick, Rugby, CV23 8AB. Tel: 01788 811153. About 3 miles south of Rugby. Rugby - Shopping - The town centre is mostly Victorian, but a few older buildings survive. Much of the architecture in Rugby including Rugby School and St Andrews church, was designed by William Butterfield in the 19th century. Marks & Spencer, 4 High Street, Rugby, Warwickshire, CV21 3BQ. Tel: 01788 565177. Rugby - Entertainment and attractions - Cineworld Cinema, Juction One Retail & Leisure Park, Juction One, Rugby, CV21 1RW. Tel: 0871 200 2000. STANFORD HALL, Lutterworth, Leicestershire, LE17 6DH. Tel: 01788 860250. About 4 miles east of Rugby. Rugby - Other information - The Lewis Gallery, Rugby School, Rugby, CV22 5DP. Tel: 01788 556 245. Rugby Art Gallery and Museum, Little Elborow St, Rugby, CV21 3BZ. Tel: 01788 533 201. Rugby School Museum, 10 Little Church Street, Rugby, CV21 3AW. Tel: 01788 556 169. For hotels accommodation in other areas nearby see Daventry hotels & Leamington Spa hotels. For bed and breakfast accommodation see bed and breakfast in Nuneaton bed and breakfast in Leamington Spa. Rugby is about 3 miles south of Junction 1 of the M6 Motorway. Rail Stations (Not all stations shown). There is a station in Rugby.